Also known as the Loggia della Signoria, the Loggia is a fabulous 14th century structure that can be found at the confines of the Uffizi gallery in Florence, its wide arches face onto the Piazza della Signoria, house and home of the local Florence Council. The arches onto which the clustered pillars were of such appeal to local Florentines at the time of their unveiling, that Michelangelo proposed that they could encircle the entirety of the Piazza della Signoria. The Medici family over-ruled this idea citing time constraints. The Loggia was designed and built over a six year period, beginning in 1376 by Benci Cione and Francesco Talenti (who were believed to have been inspired by Jacopo Sione). It was Jacopo’s desire that the Loggia would house public ceremonies including debates and swearing in ceremonies. It has been erroneously been depicted as being created by the artist, Orcagna, when in fact it was Talenti – of famed contributions to the churches of San Carlos and OrsanMichele – who designed it. The elaborate design of the Loggia contrasts brusquely with that of its neighbouring Palazzo Vecchio, since it was designed to be a wide arched sculpture gallery of antique and art. Cosimo 1st used the Loggia to house his versatile mercenaries. The Loggia was designed and built over a six year period, beginning in 1376 by Benci Cione and Francesco Talenti (who were believed to have been inspired by Jacopo Sione). It was Jacopo’s desire that the Loggia would house public ceremonies including debates and swearing in ceremonies. It has been erroneously been depicted as being created by the artist, Orcagna, when in fact it was Talenti – of famed contributions to the churches of San Carlos and OrsanMichele – who designed it. The elaborate design of the Loggia contrasts brusquely with that of its neighbouring Palazzo Vecchio, since it was designed to be a wide arched sculpture gallery of antique and art. Cosimo 1st used the Loggia to house his versatile mercenaries known as Lanzichenecchi. It was the architect Bountalenti who modified the arches so that the Medici rulers could view the goings-on from the Piazza above. The covered gallery was given different designs during the 6 years by Talenti and Cione Dami of the city of Lombardi. It has a uniquely gothic style and is believed to have been a piece that marked the dawn of the renaissance style. The tradition of placing sculptures at the Loggia began in 1490s after the Florentines had ousted the Medici rulers (and so ending their more than century year rule over the city). Some of the first sculptures to be transported to the city were from the former Medici Palace to Palazzo Vecchio. 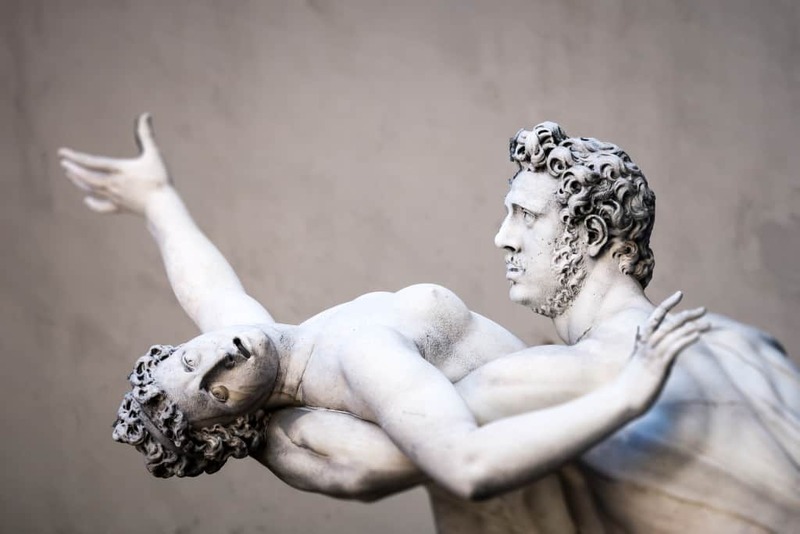 When the Medici regained control of Florence, they forced the Florentine sculptor Cellini to create a sculpture of Perseus beheading Medusa in 1550s as a warning to their rivals. The collection of sculptures inside the Loggia has expanded massively from its inauguration. Some of the famed sculptures on site include the Abduction of the Sabine Virgins (1585), ‘Hercules slaying the Centaur Nessus’ (1599), ‘The Abduction of Polyxena’ (1800s) and ‘Menelaus supporting the body of Patroclus’ (1600s). The stairway has two Medici lions one of which was built by Flamimio in 1590s and placed in the loggia in 1790. Besides the Perseus, Cellini also decorated a marble pedestal with four statuettes depicting Mercurius, Jupiter, Dname and Minerva. The Loggia di Lanzi receives up to 10,000 visitors every single day. It was the architect Bou ntalenti who modified the arches so that the Medici rulers could view the goings-on from the Piazza above. The covered gallery was given different designs during the 6 years by Talenti and Cione Dami of the city of Lombardi. It has a uniquely gothic style and is believed to have been a piece that marked the dawn of the renaissance style. The Loggia dei Lanzi of todayThe tradition of placing sculptures at the Loggia began in 1490s after the Florentines had ousted the Medici rulers (and so ending their more than century year rule over the city). 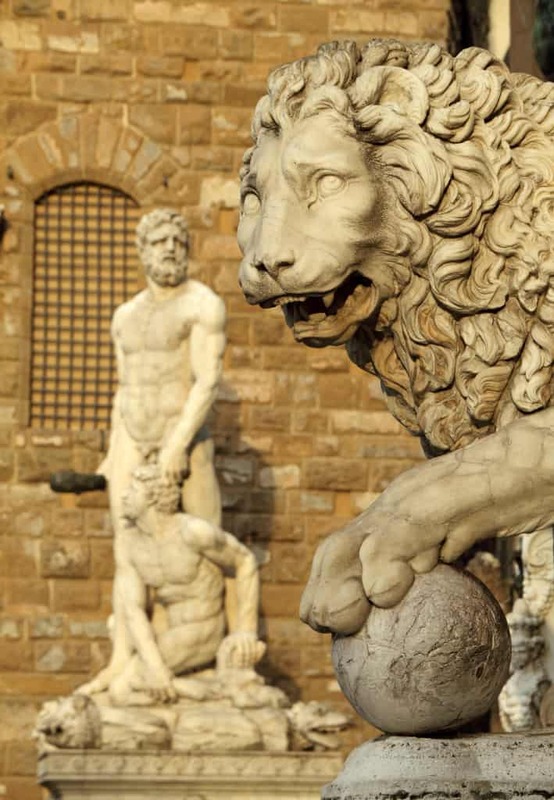 Some of the first sculptures to be transported to the city were from the former Medici Palace to Palazzo Vecchio. 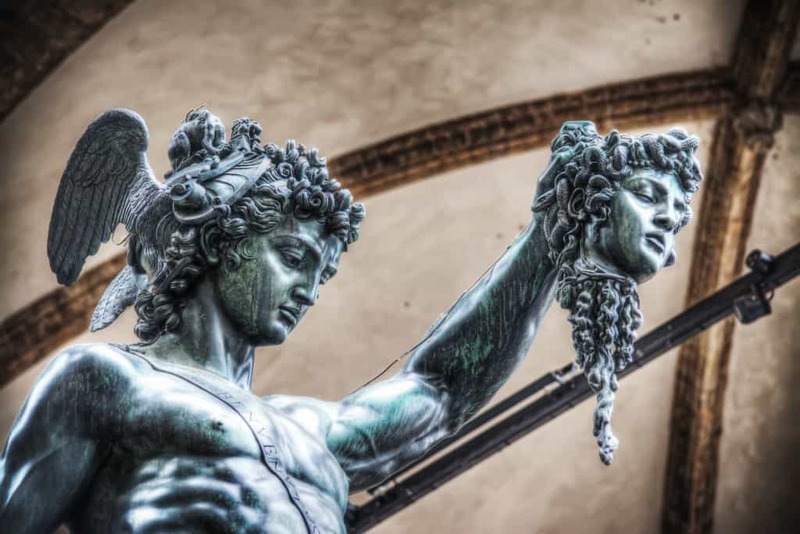 When the Medici regained control of Florence, they forced the Florentine sculptor Cellini to create a sculpture of Perseus beheading Medusa in 1550s as a warning to their rivals. The collection of sculptures inside the Loggia has expanded massively from its inauguration.